← Why cover your mouth when you sneeze? While I really enjoy the desktop gadget feature of Windows 7, I find it slightly unusable. The purpose of the gadgets I use is to display information at all times. I don’t want the gadgets transparently floating over my current applications, as they interfere with scrollbars and such. I just wanted a sidebar, similar to Google Desktops, or Windows Vista. 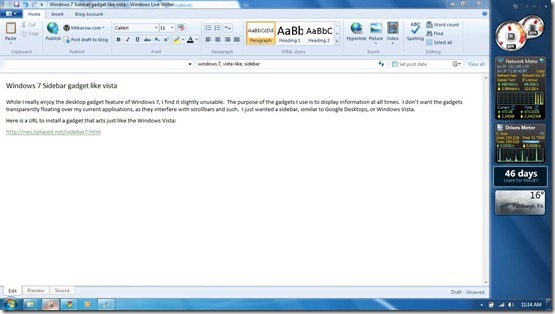 This entry was posted in Geek Stuff and tagged sidebar, vista-like, windows 7. Bookmark the permalink.